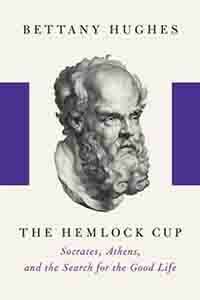 Bethany Hughes attempts to bring together three forms of context for Socrates in The Hemlock Cup. First, there is the chronology of Socrates life using primary and secondary textual sources. Second, she employs contemporary archaeological findings to “flesh out,” hypothesize and, perhaps, speculate on Socrates’ physical, socio-political and cultural environment. Woven through these two dimensions are visits to the locales involved in this ancient Athenian story described as they are seen in the present day. This multi-dimensional synthesis parallels a kind of guided tour to Socratic Greece of the 5th century, focusing mainly on Athens’ zenith and, arguably, it’s ancient nadir. If the reader is not already a lover of all things concerning ancient Greece and does not live within the sphere of BBC TV and their documentaries, he or she can find Bethany Hughes by typing her name into the You Tube search engine. There you will find a number of BBC documentaries hosted by her. Her television charisma is enchanting, and the material covered in these documentaries is stimulating. One would think that this engaging erudition would translate onto the written page, but it has not. The synthesis in The Hemlock Cup is simply too busy, too crowded; not quite, but almost smothering. At the same time, the prose does not flow because of the need to kowtow to the many “masters” enumerated above: chronology, history, archaeology, anthropology, travelogue, and political critique. At times the book feels fragmented, but then annoying repetitive. It feels as if you’ve read certain phrases in the book before. I am not sure if this is a playful literary “nod” to the repetitive construction found in Homer’s epics, but after a few instances, the “gadfly” stops being Socrates, and becomes the composition itself. As well, it is not a book for persons uninitiated to an understanding of the time period and players involved. It is shot through with fascinating details and, on the whole, I enjoyed the book, but there are defects. Although some background is filled in, there are passing references that may make those with more than rudimentary knowledge turn to a search engine for clarification. Without my university background in the Classics and ancient history and my visits to ancient Greek sites, I suspect I would have been lost or flailing for understanding more than once in the course of the read. For instance, the “jointed dolls” referred in the book that served as toys for ancient Greek children really must be seen to be understood. These toys are not like modern toys and might strike us from a modern perspective to be reminiscent of horror film voodoo dolls.